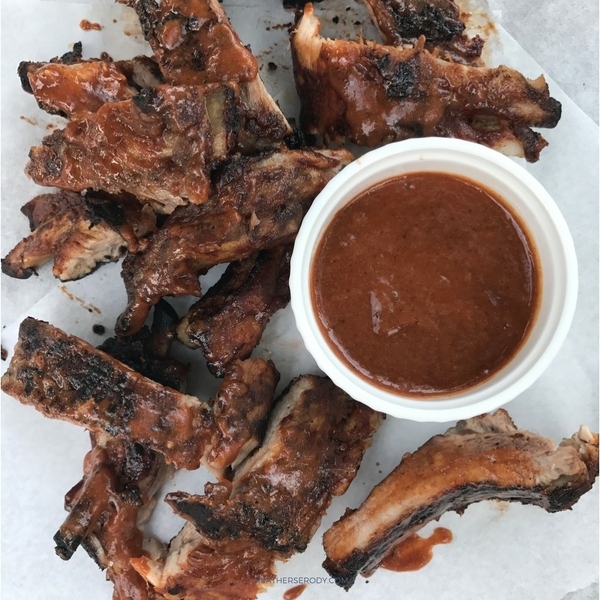 Let's face it, BBQ ribs come with lots of problems – like how they stick to the grill, and how the BBQ sauce is like lighter fluid for the flames so you spend all your time putting out small grill fires, and then they still get burnt to a crisp, and yet they're undercooked. Then I'm always suspicious that the BBQ sauce has a ton of sugar in it, so I don't even want to look at the label. Plus it's 1000ºF outside here in south Florida and when you add a hot grill to that the whole thing is a big problem for me. So, I set myself to task to make BBQ ribs less hassle. Because let's face it, life is too short to not enjoy tangy delicious ribs. C'mon, now. Here's how you make BBQ no problem. First, you'll roast the ribs in the oven until they're 95% cooked. Then you'll finish the ribs on the grill for just 5-10 minutes on a medium/low flame with smoker chips going to impart the char and smoky flavor. As for the too much sugar in the BBQ sauce problem, thankfully you can now get pre-made stevia sweetened BBQ sauce from Simple Girl right on Amazon. Three cheers for finally getting more options for low carb condiments. 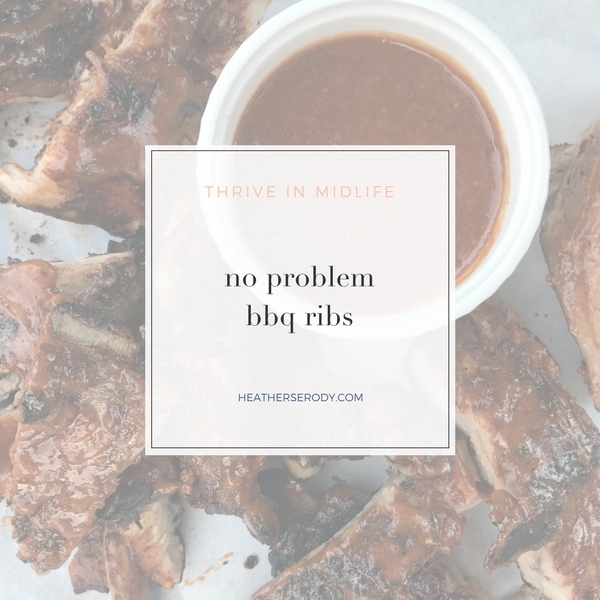 I still think my smoky maple low carb BBQ sauce recipe is yummier, but like I said let's just keep the whole ribs thing problem-free from now on and do whatever works best for you. Line a sheet pan with heavy duty aluminum foil. Place ribs on the sheet pan & sprinkle with salt and pepper on both sides. Pour 1 C of BBQ sauce over the ribs, coating both sides well. Cover ribs with heavy duty foil sealing edges. Bake ribs for 1 hour and 15-30 minutes or until meat is tender, but not falling off the bone. While ribs are roasting, light a grill to medium heat and clean and oil the grates well. Add smoker chips. As soon as ribs are out of the oven, grill rib halves for about 5-10 minutes flipping once to impart char and smoky flavor. Remove ribs from grill to a platter and cover with foil to rest for 5 minutes. Cut ribs apart. Heat remaining BBQ sauce in the microwave and then coat ribs with the remaining hot BBQ sauce.